If you're heading to Lake Richland Chambers, here is a list of where you can rent a boat on Richland Chambers. Here is a link to our review of Richland Chambers Lake. 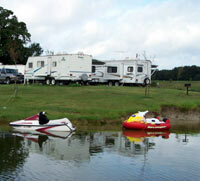 Fisherman's Point Marina & Resort rents canoes and pontoon boats for you to enjoy on Lake Richland Chambers. They also have campsites right on the water, a cafe, cabins, a boat ramp and marina, and more for you to enjoy - so make it a fun weekend. Read our review of .